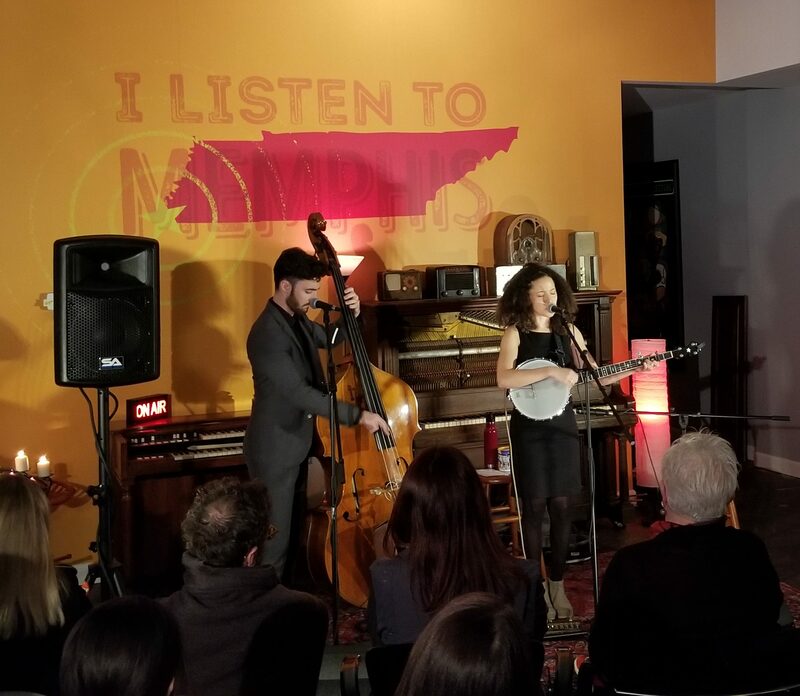 I knew from our pre-show conversations that native-Montrealer Kaia Kater was performing her first Memphis show with us, so I was a little surprised to see a well-worn Stax Museum sticker emblazoned across her banjo case. As it turns out, Kaia spent her adolescence hanging out at the Folk Alliance conference back when it was held in town. She’d beg her festival-presenter mom to let her tag along on those non-stop days-into-nights showcases and hotel room jam sessions and, because show-presenting moms are the best, she got to do just that. So along with all the music history contained in our city, the act of being open to a worldwide collection of musicians also influenced and inspired Kaia’s journey. Even with the depth and breadth of tradition that Kaia brings to her art, however, she is a fundamentally new voice. She is not the first folk musician to reach back to Appalachian musical styles to tell American (like the WHOLE American continent) stories, and she is not the first woman of color to speak passionately about the long shadow of racial injustice, but she is among the first of her generation to be both those things at once. Her performance and recording at Beale Street Caravan melded spirituals and prison work songs that shaped the earliest iterations of popular music along with her original compositions that view contemporary issues through the lens of history. Accompanied by Andrew D. Ryan on bass, vocals, and body percussion, Kaia enraptured the audience whether she was picking or performing a capella. Her voice is rich, low and intent on its course. Once you hear it, you want to know where she’s going. Kaia and Andrew harmonized vocally and instrumentally with graceful ease, creating a sound together that was powerful enough to both fill and hush the room. And although much of the subject matter was deep and sobering, Kaia’s warmth and accessibility provided the perfect counterbalance. As Kaia performed, she was standing directly under a wall mural proclaiming, “I listen to Memphis.” The manifesto is for Beale Street Caravan’s 3 million global listeners but it was equally apt for Kaia herself. Although Folk All Y’all focuses primarily on giving touring songwriters a haven in this city, I’ve seen over and over that even the newcomers feel rooted here. I’m constantly reminded how lucky we are to have a musical community that has built connections all over the world, and I dearly hope we continue to attract and inspire artists like Kaia Kater for generations to come.